Every Monday morning, Crazie Talk culls Duke basketball news, articles, and videos into a half dozen of the best “Deviled Eggs” on the interwebs. They’re back, and they’re better than ever! Duke likes Austin Rivers. Austin Rivers likes Duke. Let’s make this happen. How hysterical would it be for all of his haters if Greg Paulus made an NFL roster? And that too, the reigning Super Bowl champions? The kid is alarmingly unathletic. Oh wait. UPDATE: Greg impressed the Saints coaching staff enough to earn a chance to compete with former Mizzou QB Chase Daniel and Saints 7th round pick Sean Canfield for a spot on the roster (behind the pre-eminent Drew Brees). Congrats to Greg, and good luck GP2! Obviously Duke won big with Nolan Smith and Kyle Singler choosing to return for their senior years. But more than a few teams returned key contributors to already solid teams, most notably Purdue and Michigan State. National runner-up Butler did lose out on its brightest star in Gordon Hayward, but the Dec. 4th rematch of the two finalists should be more than entertaining. Michigan State a potential ACC/B10 foe? Duke is due for a home matchup in the ACC-Big Ten Challenge. Izzo says it’s ‘probable’ that he and his pre-season number two team in the country will be making a trip to Durham, and we agree. But with the return of Purdue’s JaJuan Johnson there’s also the possibility of playing Purdue. 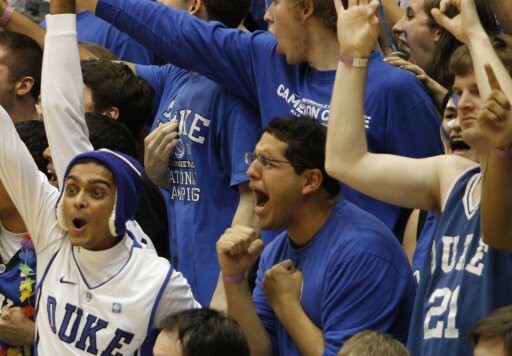 Regardless, Duke will be playing a fellow top three team this fall in the one and only Cameron Indoor Stadium. It should be fantastic. UPDATE: We will play MSU according to Jeff Goodman of Fox Sports. Bring it on, Sparty. The first three time winner of the NBA Sportsmanship Award has made every one of his coaches and teammates gush about him. After a sixteen years in the league, Grant has finally made it to Western Conference Finals with the red hot Phoenix Suns. Here’s to hoping Grant can add to his already abundant collection of finger jewelry. This is absolutely hysterical, but watch out for some profane language. DUI and NdotSmitty are a match made in heaven. Thanks, Josh! We’ll have more on Austin and all of our recruits in the next few weeks. The future is bright.